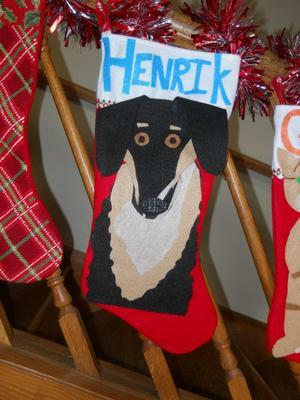 I made this stocking for my Australian Shepherd, Henrik, out of felt. Everything was made with him in mind, even the crazy font and giant letters. He always has that crazy look on his face too. I loved it so much I made ones for the rest of the pets in the family. He's a great pup. He's 13 months old and so full of life and love! He loves Frisbee and playing with the small dogs at the dog park - he's so gentle. I can't wait for all the adventures we're going to go on together. Australian Shepherds are awesome! Wow - How Cool Is That ! That Christmas stocking is so cool. Do you make them for sale? You should you know.